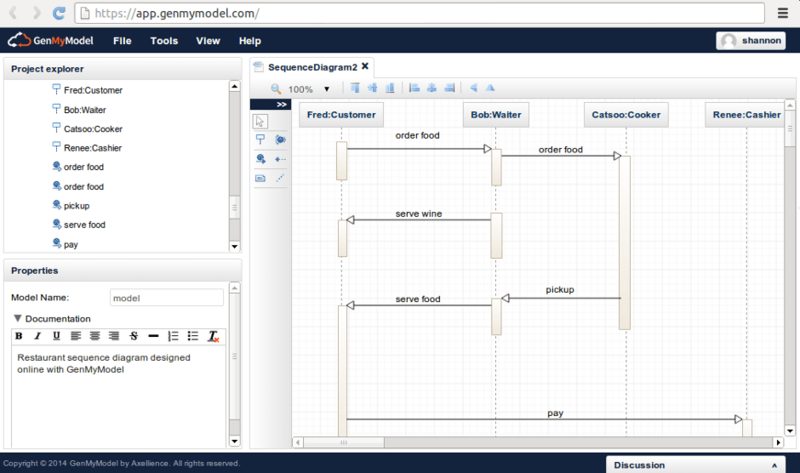 Many of you told us how important sequence diagrams are for you in UML modeling. We are pleased to announce that they are now available in GenMyModel. The feature is still experimental in this first version. We’re working on the ergonomy to make it as easy as possible for you to diagram so if you have any suggestions to improve, we definitely want to hear them! A UML sequence diagram is an interaction diagram that illustrates how processes operate with one another and in what order. These are useful for application analysis and system design. Sequence diagrams show the lifelines of different processes or objects (depicted as vertical lines) and the messages exchanged between them (horizontal arrows) and their order for carrying out a signal scenario. A sequence diagram is often associated with a particular use case and is used to explore the event scenarios. They are especially helpful when certain scenarios need to be explained better or to provide additional communication. In fact, sequence diagrams can be very communicative when it comes to your system design. Do you use sequence diagrams when you model? What do you think of this new feature?